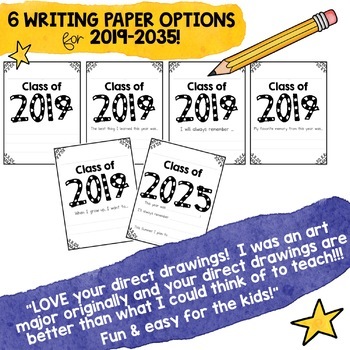 This project is the perfect way to make the end of the school year so special for your students! It would be great as a bulletin board, memory book addition, hallway display, or whatever else you think would be fun. ✅A beautifully detailed, full color 32-slide presentation that guides your artists step-by-step through every detail of their drawing. 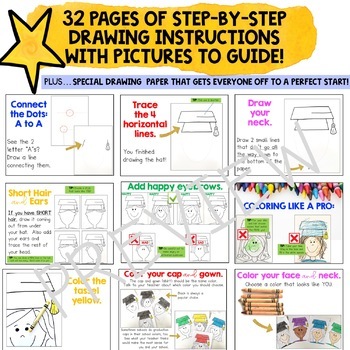 Clear, simple instructions, thoughtful tips, creative options and even visual examples of common mistakes are all included to help ensure a successful, tear-free drawing experience for everyone (including you, teachers- haha)! It’s SO SIMPLE to teach because you just flip through the slides, read them aloud, and monitor student’s progress. child one of these to start drawing on. It includes a couple lightly printed anchor points and small lines for artists. Everything is still uniquely hand drawn by the kids, but the special papers just give them the boundaries they need for a stress-free, positive art experience. 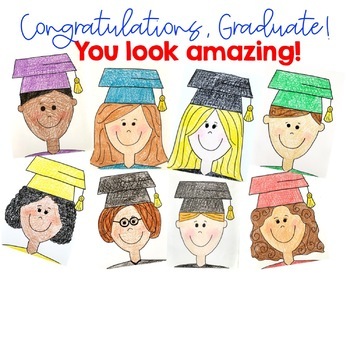 For younger artists or teachers who want a little bit quicker project, I’m also including a page that has the graduation hat pre-drawn so all they have to do is follow the directions for drawing their face and shoulders. If you're looking for more directed drawing resources, I have a year-long bundle (this new graduation project is NOT included there): The YEAR-LONG BUNDLE includes 11 beautiful directed drawing projects! Click here to check it out! CLASSROOM TESTED, STUDENT & TEACHER-APPROVED! ❤️ "The kids LOVED it. I'm a big fan of directed drawing activities, and this one is laid our beautifully. So fun!" ❤️ "I was amazed at how these turned out! I love how directed drawings still turn out so individualized. Such a great confidence booster for the kids!" ❤️ "Love this. It is easy to follow, has everything anyone can need for this project, and it looks amazing." ❤️ "Wow - fantastic! I love to do directed drawings and you have set this set up beautifully. I especially like the paper to give students the starting positions!" ❤️ "I like directed drawing because I can fit it into my lesson, the kids have to follow directions and they feel good about something that they have created." ☀️ Camping : an Engaging, Rhyming, Emergent Reader Book Kids LOVE! ☀️ Butterfly Directed Drawing ... Perfect for Spring , Bugs , or anytime! ☀️ End of the Year ... Build community . kindness . reading & writing skills! ☀️ Graduation Kids! Adorable End of the Year Writing Project! 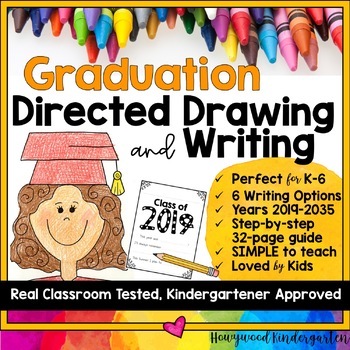 ☀️ Kindergarten Graduation Cap, Diploma, & End of the Year Celebration Ideas! ☀️ Kindergarten Writing Autobiography: How I Made it to Kindergarten! ☀️ Directed Drawing Bundle! Art for every season! ☀️ Mother's Day or Father's Day ... Superhero Directed Drawing & Writing! ☀️ Mother's Day Directed Drawing .. Students draw themselves & someone special! ☀️ Mother's Day Project Pack! 3 precious projects to celebrate mom &/or grandma! ☀️ Sharks FREEBIE! Zoo Animal Research Mixed w/ Authentic Literacy Practice! ☀️ Spring Hot Air Balloon Project! Perfect for Spring , March , End of the Year ! ☀️ Sunflower Directed Drawing ... Spring ... Mother's Day ... Beautiful! Look for the green star next to my store logo at the top right corner of this page and click it to become a follower. This will allow you to be FIRST to find out about when I post exciting NEW products and freebies! Be sure to take a moment to leave feedback for all your purchases on TPT! Not only do I love to hear from buyers, but it also helps YOU earn points to put towards any future TPT purchases! Win-win!